Good morning beautiful people! I woke up this morning tightly tucked into my bed sheets because for Dubai standards it was absolutely freezing! But I love, love, love this weather.. It reminds me of the grey days in Paris and oddly enough this dull weather puts a smile on my face.. But maybe the bigger reson for the smile was me travelling to Beirut later on today :) I had a bit of an issue for Baby Phares's passport and visa, so due to this mishap I was away from my favorite man for a little while and thus haven't been in the best of moods this past week to say the least! Forget not in the best moods - I was down right a mean person! But finally it's sorted out now, and I'm going to pick up Phares from his granny's in Beirut. It's nuts, but I was so excited I couldn't fall asleep for hours last night. I can't wait to have my munchkin back home with us.. In a food processor, blend all the above listed ingredients with a few ice cubes until smooth. 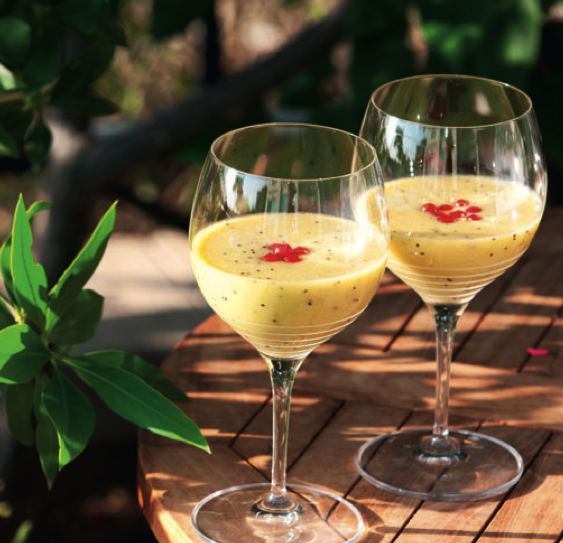 Pour the smoothie in serving glasses and top with a few cranberries. Enjoy!